The provision of an appropriate wheelchair that meets the user’s physical, functional and environmental needs as much as possible requires an approach that responds to individual needs. An effective way of meeting the individual needs of users is to promote the provision of wheelchairs through wheelchair services. Wheelchair services work with wheelchair users to find the most suitable wheelchair among those available to meet the needs for that user. Careful planning and management of services and well-thought-out strategies for wheelchair provision, user instruction and care are needed to facilitate the important link between the user and the wheelchair. Appropriate provision of wheelchairs is most important in the successful rehabilitation of people who need a wheelchair for mobility. 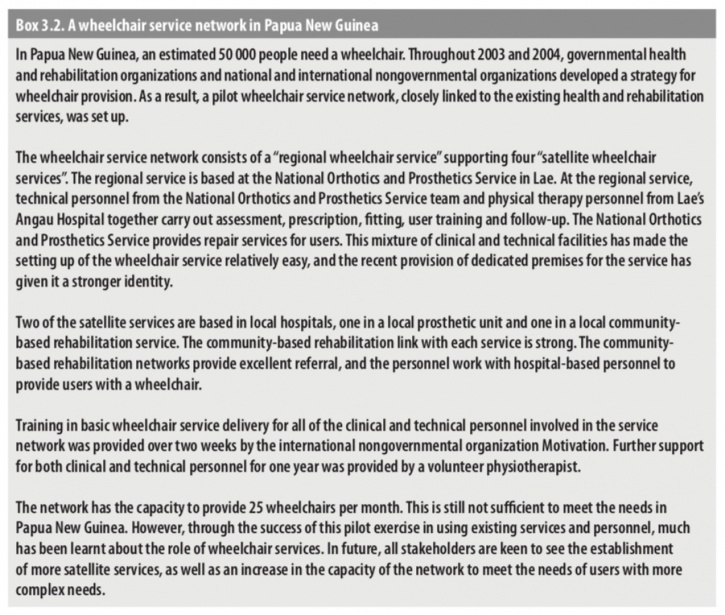 Historically, however, wheelchair service delivery has not been an integral part of rehabilitation services. This is due to many factors, including poor awareness, scarce resources, a lack of appropriate products, and a lack of training for health and rehabilitation personnel in wheelchair service delivery. In many countries, users depend on charity or external donations. Donated wheelchairs are often inappropriate and of poor quality, giving further problems for the user and for the country in the long run. Users are not in a position to demand good quality from charities. A study in India revealed that 60% of wheelchair users who had received donated wheelchairs stopped using them owing to discomfort and the unsuitability of the wheelchair design for the environment in which it was used. The result is that many people who require a wheelchair do not receive one at all, while those who do often get one without any assessment, prescription, fitting and follow-up. Many users, even people with spinal cord injury, often get wheelchairs without a cushion or basic instructions, which can lead to pressure sores and even premature death. There is, however, increasing awareness of the importance of providing individual assessment, fitting and training in how to use a wheelchair. In a number of less-resourced settings, wheelchair services have been established using different models of service delivery. Such models include centre-based or community-based services, outreach services, mobile “camp”-style services and donations of imported wheelchairs. In countries where user groups are well informed and service providers have the necessary knowledge and support, wheelchair services are becoming integrated into existing rehabilitation activities. The common aim is to ensure that users are given skilled assistance in selecting the most appropriate wheelchair for their needs. Wheelchair provision is about enabling people with disabilities to become mobile, remain healthy, and participate fully in community life. Wheelchair services provide the framework for assessing individual user needs, assist in selecting an appropriate wheelchair, train users and caregivers, and provide ongoing support and referral to other services where appropriate. A range of different models for service delivery exist and countries need to develop a model which is suitable for their given context and capable of responding to the identified needs within the country. Integration and decentralization of service delivery are important considerations and can help improve the availability, accessibility and affordability of services. Similarily providing community-delivered services as a part of the continuum of care e.g.Community-Based Rehabilitation (CBR), can respond to issues such as hard-to-reach populations (i.e. people living in rural and remote areas) and workforce shortages. The role of CBR personnel might be to work with people with disabilities and their families to determine their needs for mobility devices, initiate referrals to appropriate service provid- ers, facilitate access to services, and ensure maintenance, repair and replacement when necessary. There are different methods of wheelchair supply to meet the range of contexts in which users live. Whatever the method or structure chosen, it is important to deliver essential wheelchair services. It is not necessary to create a new profession to provide wheelchair services. With additional training, many health and rehabilitation personnel would be able to take on the duties required for basic wheelchair service delivery. For example, community health care workers, community-based rehabilitation workers, nurses, physiotherapists, occupational therapists, orthotists and prosthetists could be trained to fulfil the clinical role in wheelchair services. Likewise, with additional training, skilled craftspeople, mechanics and orthotic and prosthetic technicians could fulfil the technical role. Some aspects of wheelchair provision can be carried out in the community, through a network of community-based organizations (for example rehabilitation and health programmes) supported by a local wheelchair service centre. The personnel of the community-based programmes could be trained by wheelchair service personnel in basic service delivery. This system of service delivery would best suit users who require a basic wheelchair, without modifications, postural support or pressure management care. Users with more complex needs are likely to require the skills of personnel with greater training than can be provided to all community-level personnel. This need can be addressed by outreach services coordinated by the wheelchair service centre. If outreach services are not developed, these users would need to travel to the wheelchair service centre. However, once provided with an appropriate wheelchair, they may be supported by community-based personnel. A wheelchair service can make use of the skills, technologies and capacities of local industries. For example, bicycle repair shops can also repair wheelchairs, and tubular furniture makers have the basic skills and knowledge to build wheelchairs. 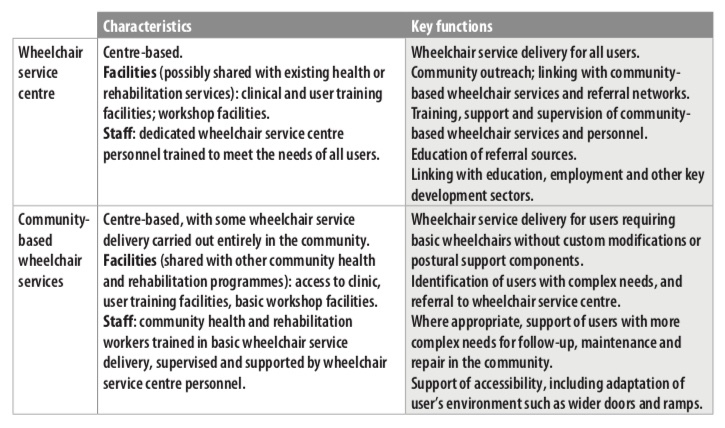 Fig.1 provides a summary of a “two-tier” wheelchair service approach. This shows a possible model linking a wheelchair service centre with a number of community-based wheelchair services. To provide adequate support to the community-based centres, it may be necessary to first develop the wheelchair service centre. Alternatively, a collaborative effort between existing community- based centres could work towards the development of the wheelchair service centre. In either case, the development process should be based on a needs assessment and other aspects of the local context. A wheelchair service centre or department can be established within existing rehabilitation services. Such services are already likely to have users accessing the service for health or rehabilitation needs. They would therefore already have much of the infrastructure required. Examples of rehabilitation services well suited to the integration of a wheelchair service include prosthetics and orthotics services and spinal injury centres. Wheelchair services could play a dual role, providing wheelchairs directly to users and supporting basic services in the community through partnerships with community-level programmes and organizations. funding to support wheelchair service delivery (products and services). Visagie S, Scheffler E, Schneider M. Policy Implementation in Wheelchair Service Delivery in a Rural South African Setting. African Journal of Disability. 2013;2(1). ↑ 2.0 2.1 William Armstrong, Johan Borg, Marc Krizack, Alida Lindsley, Kylie Mines, Jon Pearlman, Kim Reisinger, Sarah Sheldon. Guidelines on the Provision of Manual Wheelchairs in Less Resourced Settings. World Health Organization; Geneva: 2008.